this is a low end touchscreen phone that is meant to go up against chinese brand touchscreen phone so don't expect much. the price will still be higher than chinese brand phone but not too much , i hope. This phone of Nokia wont dissapoint you. The touch is good. With 1Ghz processor, the phone's feature looks good. AnonD-31088, 14 Jun 2012is nokia coming up with a feo 808 runing on android or is this a jokethat was just a joke, it wasnt true. It came about in april fools when blogger started the rumour. is youtube played on this phone? Long live S40 , but i wanna flip nok plz.Nok Roolz Sammy Suk. AnonD-58505, 15 Jun 20121stly, i was talking about phones in price range of asha 311... 1) i've tried it and i've fou... moreLet me get this straight I was referring to the galaxy pocket which is in the same price range as the asha 311. 1-I have a galaxy pocket,htc one v and I seem to have no problem while playing angry birds with all animations turned on in the galaxy pocket....the lagging which you mentioned happens only when I have 5-6 apps running in the background....and there is no lag when there are 2-4 apps running.This is wayyy better than the asha 311 which does only one task. 2-The core of the s40 is is the same with the UI changed. 3-The type of multitasking you mentioned only works when you are in the home menu but not when there is a full screen app running like a game. 4-I know what levels in angry birds mean....what I meant was the Samsung pocket can get all the latest seasons like angry birds space.But the asha 311 does not receive such updates and you will have to be satisfied with the levels that come default with the phone. 5-There are other things that you don't get on the asha 311 like GPS,navigation,compass.And the screen resolution is only 56k where as for the same price you get 256k colours in the pocket. Asha 311 is a good phone but it nowhere matches It's android counter parts.This phone is good for people who want simple phones with no multitasking but for others android is the best choice. the new s40 asha is nice but it is just feature phone quality. no full multitasking. 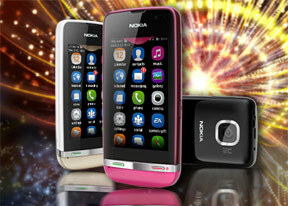 very good nokia to produced the asha 311 and all the features are in the mobiles. you don't really care, whether it's diamonds or not, once you've learned that you can make a good fortune by selling it. Are you taking to me!? Or someone else!? Please, "REPLY" to the original post before you make a little speech. But, I must admit, my original response was totally wrong. So, I would like to change it. That's much easy for you. increase Rs1000 give 3.2 camera with autofocus instead of fixed focus camera. Kindly think about it for nokia fans. if it has autofocus cemara it will be hot cake,think about it.